A Million Wags…A Million Thanks! 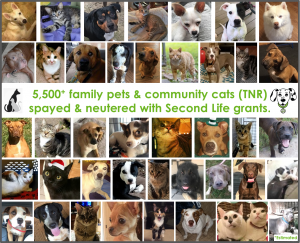 When we started on this journey called Second Life…we had big dreams to help animals. Let this number sink in – $1.2 MILLION! Your amazing support means the world to us, but more importantly…to the animals and the people who care for them! That’s really why we are all here. 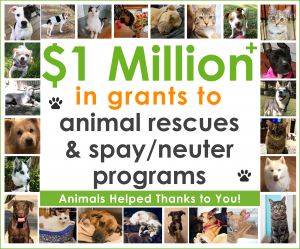 Your simple acts of donating, shopping, volunteering and promoting have created these opportunities for us to give back to animal rescues and spay/neuter programs that help families be a part of the solution to pet overpopulation. YOU are the reason for our success! Considering we donated $13,000 in grants to 4 organizations our first year and we were ecstatic, this is an accomplishment we are extremely proud of – because it means many animals got a second chance at life…and love. Who knew cleaning out your closet and home could be so rewarding! Over 7,500 Family Pets and Community Cats Spayed & Neutered! We are big supporters of spay/neuter for all family pets and community cats. With too many animals being born every day and Georgia shelters euthanizing more than 60,000 animals every year…it is not possible to adopt our way out. Spaying and neutering is a critical part of ending unnecessary suffering. Since opening, Second LIfe has provided more than $525,000,000 to organizations that focus on spaying and neutering family pets and community cats (through TNR – Trap. Neuter. Return.) Based on an average of $70 per surgery, that’s over 7,500 animals that have taken the “no mommy” and “no daddy” pledge…thanks to your support! We are proud to focus on spay/neuter as a way to help keep unwanted animals from being born…and ending up in shelters. Spaying and neutering helps keep animals healthier and is the responsible thing to do. For more information and to find low-cost spay/neuter clinics near you, visit our website.